How to Create an Affidavit For Name Change of Minor? Nowadays, one roadblock many parents run into is choosing good names for their children. While some parents do an extensive research and brainstorming before selecting names for their children, some parents tend to change the names at a later stage. While anyone above 18 years of age can opt for name change on his/her own accord by following certain formalities, in case of a minor (below 18 years of age), only the parents will have the right to change his/her name. A minor’s name can be changed by his/her parent(s) for various reasons including personal preference, numerology, astrology, inclusion of surname, change of surname (divorce or remarriage of parents), etc. Whatever the reason be, the first and foremost step of the procedure of minor’s name change would be to create an affidavit for change of name of minor. When To Use An Affidavit For Change Of Name Of Minor? As the name suggests, an affidavit for change of name of minor is intended for a minor child whose name has to be changed/corrected. The minor’s parent(s) has to make this affidavit. 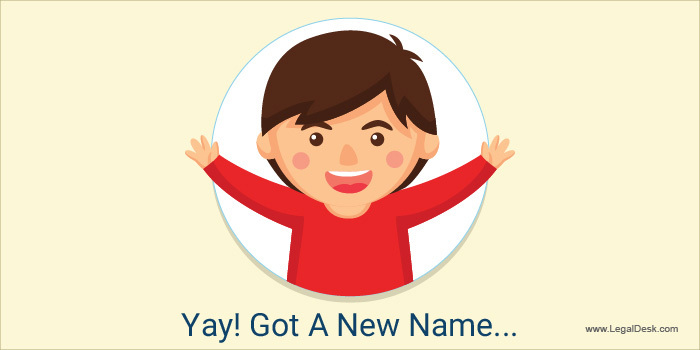 What To Include In The Name Change Affidavit For Minor? How To Make An Affidavit For Change Of Name Of Minor? The affidavit should be drafted by including all the details mentioned above. You can simply use our ready to use template by clicking the ‘CREATE DOCUMENT’ button. It should be printed on Stamp paper of recommended value. It has to be signed by the parent(s) who is making the affidavit (known as deponent). It should be attested by a Notary Public or an Advocate S.E.M. or an Oaths Commissioner. Once the affidavit is ready, the very next step in the name change of minor includes placing an advertisement in any newspaper. We at LegalDesk will be glad to help you with publishing name change ad in newspaper too. We, at LegalDesk.com, help you in the entire process involved name change of a minor or major, starting from the drafting of name change affidavit to submitting for Central Gazette notification. In order to draft the affidavit quickly, you can make use of the ready to use affidavit templates available with LegalDesk. Just choose your state and click the button ‘CREATE DOCUMENT’ to get started. Once you enter your details in the form and choose the home-delivery option, we will print the affidavit on Stamp paper and deliver it to your doorstep.